Plants such as winterberry lose their leaves but have stunning red berries. 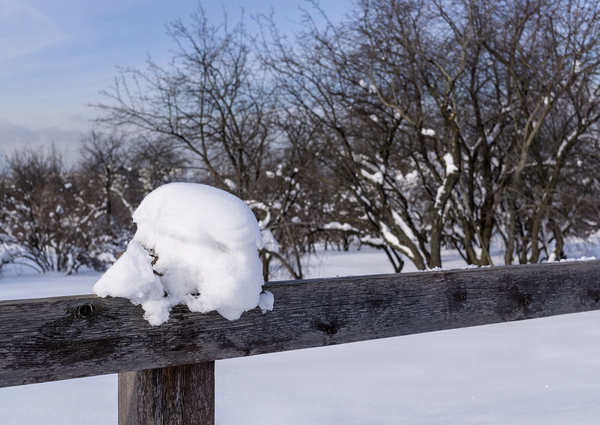 What grows in the winter time — or what can survive it? That’s the question in your Northeast winter garden. Cold weather and snow are relatively common here, so you need to think about what plants are hardy enough to survive. What are the best plant choices? Winter trees are beautiful in their own way. 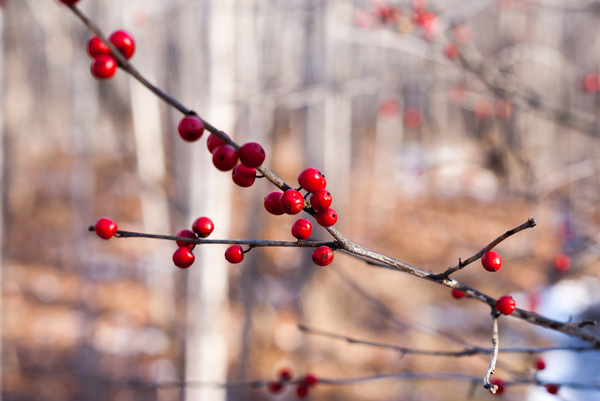 Lowes notes that some are particularly attractive: “certain shrubs, such as some dogwoods and willows, have bright yellow, red, or orange branches in winter.” Other trees such as holly and winterberry have berries that are present during the winter months as well. Cotoneaster is also an excellent, bright groundcover with red berries; though if you have a lot of snow, it will be covered. While the stark beauty of a deciduous tree in winter is lovely, it’s also attractive when you have a splash of green in your garden. Consider planting smaller evergreens to brighten up your winter garden. Instead of planting tall trees, you can add smaller hedging evergreens and other plants that do not grow too tall and drop branches on your roof. Some plants will even flower in the winter months. Flowering quince can tolerate the cold, and winter jasmine grows in areas that are a little warmer, such as close to your home. Structures such as fences and even tree branches will create a textured feel in your garden. A flat blanket of snow is attractive, but it doesn’t have a lot of visual interest after a while. Use plants to create textures in your garden. Many grasses will survive the winter months. Ornamental kale and cabbage add texture and color. Different hardscaping elements can also add texture to your garden. For instance, smooth and bumpy landscaping rocks or statues can add visual interest. If you find that your smaller plants get covered by snow in the winter, add a covered deck that you can use as an outdoor room or a refuge in the winter months. This allows you to place some of your more tender plants undercover and watch them carefully, and you can also keep plants there that have colors and textures that you’d like to enjoy all winter long. You can also add cloches, cold frames, or grow tender greens outside under that deck in the winter. Some greens such as kale are relatively cold-hardy, so even if lettuce is not on the winter menu, you might be able to work kale into your garden. No matter what you grow in your garden, you can help create a cohesive look in your garden by being well-organized, so that plants and the rest of your landscaping structures synchronize into a beautiful whole. For instance, if you have a lot of wet areas in your garden that get soggy as the snow melts, start by making sure that your home drainage is in good working order, adding gutter heat and gutter covers so that water is not overflowing and adding to the mess. Consider landscaping your yard in a way that improves water drainage, so that meltwater can move away from your pathways, foundation, and garden beds if you don’t want it to pool there, and add a French drain to move the water. Plan for winter storage in your garden as well. For instance, your barbeque and lawn chairs need a winter home. A shed or a basement will do, and this tidy feeling will help you see the beauty in your garden plants, because you’re not seeing chores to do every time you look out your window. At Harry Helmet, we’re committed to helping you create a home that is beautiful and functional. Talk with us about winter solutions such as gutter heat and year-round home solutions such as gutter covers. Schedule a free estimate today.